Learn more about Various - Electric Blues - Plug It In! Turn It Up! 3-CD Digipak (8-plated) with 156-page booklet, 65 tracks. Total playing time approx. 263 mns. Please, note: English liner notes! Bitte, beachten: englischsprachige Begleitbücher! 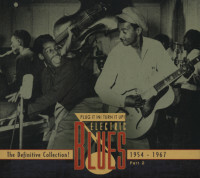 Part four of the most comprehensive history EVER of electrified blues on 12 electrifying CDs! Every significant artist ... every significant recording from the 1930s to the present day, including T-Bone Walker, Muddy Waters, Howlin' Wolf, George Thorogood, and Freddie, B.B. and Albert King, Jeff Beck, Fleetwood Mac, Charlie Musselwhite, Johnny Winter, and Stevie Ray Vaughan, and literally hundreds more! In all, fifteen-and-a-half hours! Compiled and annotated by renowned blues expert, Bill Dahl. Every 3-CD set comes with a 160-page booklet including biographies, illustrations, original release info, and rare photos! Cross-licensed from every record company to be truly comprehensive! Blues historian and musicologist, Bill Dahl from Chicago, has produced the most comprehensive history of electric blues ... ever! With nearly 300 tracks, Bear Family Records is telling the story from the beginning into the new millennium. In the 1930s, the invention of Gibson's ES-150 - the first electric guitar - changed popular music forever. The first generation of blues pioneers played acoustic instruments, but with the invention of amplification, guitar and harmonica players could be heard over the piano, drums and horns. Music was revolutionized! The 12 generously full CDs are in four sets of three CDs in elegant digipaks. On more than 650 pages in four lavishly illustrated booklets, Bill Dahl writes authoritatively about the history of electric blues, and how it influenced rock music during the 1960s and beyond. Here's the complete story from jazz-inspired jump numbers in the late 1930s to hard-driving blues/rock from the States and Great Britain in the 1960s, '70s, and beyond. The journey closes with today's contemporary blues. This is it! Truly definitive! Done as only Bear Family can do it! Interpret: Various - Electric Blues - Plug It In! Turn It Up! 05 Don't Make Me Pay For His Mistakes Hill, Z. Z. 06 A Nickel And A Nail Wright, O. V.
17 To Know You Is To Love You King, B. B. 01 The Thrill Is Gone King, B. B. 03 Down Home Blues Hill, Z. Z. 16 Old Black Mattie Burnside, R. L.
"Various - Electric Blues - Plug It In! Turn It Up!" Electric Blues - Plug It In! Turn It Up! Texas native T-Bone Walker was the primary catalyst for the electric blues guitar movement as we now know it. Beginning with his pioneering Mean Old World in 1942 (this set's second track), he wrote much of the vocabulary of postwar electric blues guitar. Sensing which way the wind was blowing, hallowed blues veterans Big Bill, Minnie, Tampa, and plenty more of the relative old-timers gamely made the switch; a new generation of younger electric blues guitarists sprang up in T-Bone's mighty wake in Texas, all over the South, in the Windy City, and on the West Coast. Most of those seminal guitar greats can be found on this collection. Amplified harmonica was a later innovation. The humble mouth organ didn't even really emerge as a credible solo instrument until John Lee 'Sonny Boy' Williamson surfaced with his Bluebird waxing of Good Morning, School Girl (Sonny Boy didn't have time to make the leap to amplifying his instrument prior to his 1948 murder, but he welcomed electric guitar into his band a few years before he was killed). 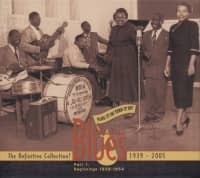 Only in the late '40s and early '50s did a dazzling young coterie of harp wizards emerge to take it to the next level by pumping their thrilling solos through a mic and amp, led by unparalleled Chicagoan Little Walter. His forward-thinking peers included Snooky Pryor, Big Walter Horton, George 'Harmonica' Smith, Papa Lightfoot, and Junior Wells. 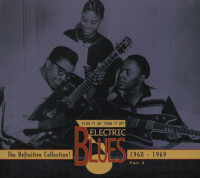 Before this series of three-CD sets concludes, the listener will be guided through all the permutations of electric blues: swinging jump numbers, lowdown solo grinders, '50s rock 'n' rollers, the hard-charging British and American blues-rock of the '60s and beyond, soul-blues of the '70s, and right on up to the contemporary blues of today, where the electric guitar continues to reign as almighty king. There's no way to include every deserving landmark of the genre on this series—that would require a virtual mountain of discs and an accompanying avalanche of words—but by the time you listen to the dozen jam-packed CDs that comprise this series, you'll have a pretty fair idea of how electric blues progressed, and who the important players were (not to mention a raft of unsung heroes). Without the advent of amplification, blues as we know it in the 21st Century would never have existed. Here are the legends who invented electric blues. Bear Family's "Plug It In! Turn It Up! Electric Blues 1939-2005" beat out four other nominees to win the Historical Album category at the 2013 Blues Music Awards, held May 9, 2013 at the Cook Convention Center in Memphis. Bill Dahl, reissue producer of the comprehensive 12-CD series for Bear Family, was in attendance to accept the coveted award at the gala ceremonies, attended by 1300 blues artists, musicians, various movers and shakers, and devoted fans of the genre. The annual Blues Music Awards are regarded the most important and prestigeous blues music industry awards, worldwide! 3-CD Digipak (8-plated) with 160-page booklet, 77 tracks. Total playing time approx. 218 mns. 3-CD Digipak (8-plated) with 172-page booklet, 79 tracks. Total playing time approx. 221 mns. 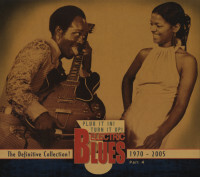 Vol.4 Electric Blues 1970-2005 (english) BCD 16924 3-CD Digipak (8-plated) with 156-page booklet, 65 tracks. Total playing time approx. 263 mns. Customer evaluation for "Vol.4 Electric Blues 1970 - 2005 (english)"
This collection is the first time I bought cd's in about 10 years! I am still going through the first listening of the collection and hope to open the 4th package sometime today. Bear Family is simply the best. The booklets that come with them are incredible in their detail and the photos are like a time machine. I would recommend it to anyone who loves Blues music. It's a rare pleasure to be able to put a disc in the tray, press play, and know that every track will be enjoyable as well as significant. Quibble with \definitive\", if you wish - but it does not get better than thus! Blues in Britain 11/12	Norman Darwen"
Eine bessere Veröffentlichung zum Thema dürfte schwerlich zu finden sein! 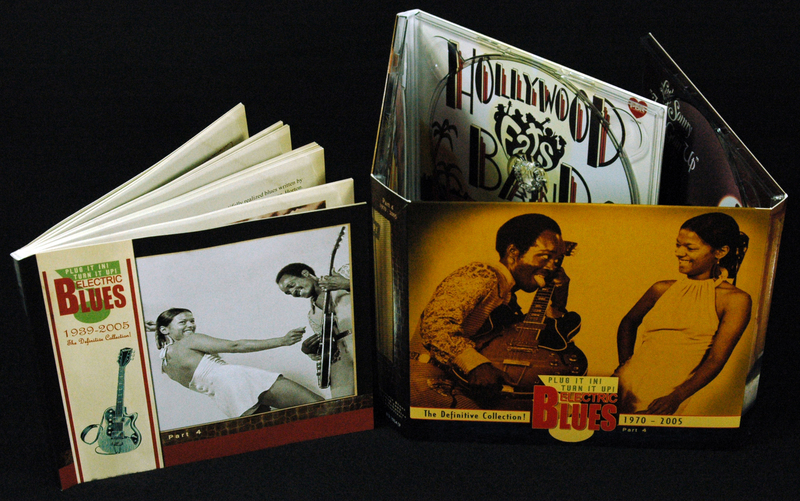 Mit einer gigantischen Kollektion von vier 3 CD Boxen verfolgt Bear Family die Geschichte des elektrischen Blues von 1939-2005. Das ist eine historische Aufarbeitung wie sie sein soll. Wer auf Label übergreifende Auswahl steht, wer qualitativ hochwertig sowie tief und umfassend alles über den elektrischen Blues erfahren möchte, für den gibt es kein Vorbeikommen an diesem Standardwerk! Für alle, die den Blues noch nicht so lange entdeckt haben, ist dies ein toller Einstieg! Weitere Artikel von Various - Electric Blues - Plug It In! Turn It Up!